As you continue your journey from Grants you’ll head on out to through several small villages including Milan, Bluewater, Prewitt and Thoreau before reaching the Continental Divide. This 31.4-mile segment was designated as State Highway 6 in 1914 and a part of the National Old Trails Highway, a trans-regional road association that preceded the creation of the Federal highway system in 1926. The road’s climb out of the Rio San Jose drainage toward Continental Divide takes motorists out of an area that was known for its irrigated agriculture, especially carrots, in the 1940s. The discovery of uranium and development of nearby mines in the 1950s is evident in distant tailing piles and settling ponds near Bluewater. As the road begins to climb toward the Continental Divide, the highest point on Route 66 with an elevation of 7,263 feet, pastures give way to a pinyon and juniper landscape with Navajo homesteads, trading posts, and other businesses periodically lining the roadside. From Prewitt westward, Entrada sandstone cliffs parallel the road to the north, offering a stretch of spectacular unbroken red sandstone extending to the Arizona border. This roadbed remained gravel until the 1930s, when Federal funding resulted in projects to realign and pave the highway. Among these improvements was the elimination of two grade crossings by realigning the highway entirely south of the Atchison, Topeka & Santa Fe Railway line. 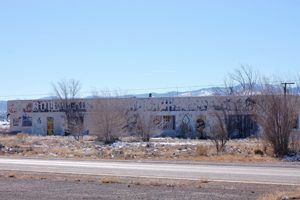 As a result, Thoreau and other villages, which prospered with roadside commerce in the 1920s, saw businesses disappear or relocate in the late 1930s, when Route 66 no longer passed along the towns’ main streets. 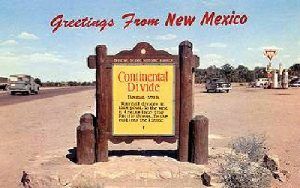 Milan to Continental Divide, NM: This road segment is now designated NM 122 and serves as a frontage road along I-40 from west of Milan to the Continental Divide. The eastern 8.6 mile stretch is a divided four-lane road completed in 1951 when several sections of Route 66 in New Mexico were widened. The remaining 22.6 miles is a two-lane road, often closely paralleling I-40 and the tracks of the former AT&SF Railway as it climbs toward the Continental Divide. Just three miles beyond Grants, is the village of Milan, basically a suburb of Grants today. Before the uranium mining boom of the 1950s, Milan was not a town, but rather, a small cluster of service-related businesses catering to Route 66 travelers. However, with the mining success, the town was incorporated in 1957 and named for Salvador Milan, who was a major landholder in the area and served as the town’s first mayor from 1957 until his death in 1970. Salvador Milan, along with his sister Mary, was exiled from Mexico during the revolution of 1913. Over the years, Milan continued to grow, but recently has boomed with its population increasing at the rate of 71.6% between 2000 and 2010. Today it is called home to about 3,300 residents. Milan is the site of the privately run Cibola County Correctional Center, which houses more than 1,000 federal prisoners and is a major employer. This facility first opened in 1993 as a county prison but was acquired and expanded by the Corrections Corporation of America in 1998, resulting in the large population boom. Growth continues in Milan as many new houses and service-oriented businesses are being built to accommodate its increase in population. One Route 66 classic in this small town is the Milan Motel. Situated on on the south side of Route 66 between Milan Street and Airport Road, this log cabin style motel was built in 1946. It had 12 units, a snack shop and gas pumps. 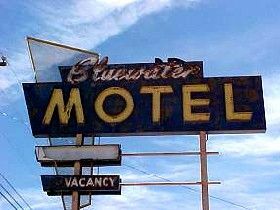 It survived the bypassing of Route 66 by I-40 and the Uranium bust, but finally closed in the 1980s. The property was restored with a National Park Service Route 66 Corridor Preservation Program grant and now serves as a Trading Post. Between Milan and nearby Prewitt is an interesting section of the old road as it is quite wide but very seldom used. At intervals, abandoned motels and empty gas stations can be seen along this stretch of the road. When Route 66 was young this was a major carrot-producing area covering thousands of acres. As visitors continue the journey westward, there are several lava flows in the region, associated with the much larger deposits of the nearby El Malpais National Monument south of Grants. About eight miles beyond Milan, West bound Route 66 travelers will arrive at what was once the stopping point of Bluewater. In 1870 several French ranchers came to the area and organized a cattle company, irrigating their ranches from a small reservoir. The town got its start when the Atlantic and Pacific Railroad, later Atchison Topeka & Santa Fe Railroad built a station there in 1881 and named it after Bluewater Creek. Local ranchers built an earthen dam on the creek in 1885, but floods washed it away a year later. In 1889 a post office was established. In 1891-92, the area suffered a severe drought, causing many cattle to die and many of the defeated ranchers gave up and left the region. Soon, a Mormon man named Ernst A. Tietjen, who lived in nearby Ramah, claimed the land and built an earthen dam for irrigation at the point where the Cottonwood and Bluewater Creeks met. Unfortunately, that dam also washed away in 1904. In 1905 Ernst A. Tietjen finished homesteading his land and obtained a clear title. He then began to have the land surveyed and a townsite laid out. He sold the first lot to E.H. Dewey for $15 and before long a school was built. The dam was replaced with a cement one which in turn was replaced by the current concrete arch dam constructed in 1926-27 by the Toltec-Bluewater Irrigation District. The water was used to irrigate the farms downstream towards Grants, which became at that time the “Carrot Capital of America”. In 1926 Route 66 was aligned just north of Bluewater between Gallup and Grants. Although never much more than a railroad loading station; a trading post, two motels, a café, garage, and gas station, this stopover point once did a brisk business. In 1935, a popular stop along this stretch, was the Old Crater Trading Post built by Claude Bowlin. It was named after a local volcanic crater. Bowlin had been trading with the Navajo since 1912 and his first trading post sold food and goods to the tribe where he learned their language and customs. After World War I, from 1919 to 1935, Mr. and Mrs. Bowlin bought and sold several trading posts in the Gallup and Farmington areas of New Mexico. The Bluewater store was built with a flat roof, stucco walls with protruding viga beams and featured colorful murals on its exterior. Selling rugs, dolls, jewelry and pottery, it was popular with tourists along Route 66. In 1938, gas pumps were added. Bowlin opened more stores in New Mexico in the 1950s. When Uranium was discovered in the area, business boomed and the original store was demolished and replace with a new one in 1954. When I-40 bypassed it, the trading post was closed for good in 1973. The old building, located about 1.5 miles north of Bluewater still stands. However, Bowlin’s Bluewater Dairy Queen Travel Center now serves this area on I-40.